So I’m back in NYC after an action packed yet relaxing trip to Wisconsin and Colorado. I had some wonderfully unique and delicious food experiences in both states which I will happily share with you over the next few weeks, but before I jump into those posts, I want to tell you about my long overdue visit to the Williamsburg waterfront for Smorgasburg! Smorgasburg is the culinary spin-off of the Brooklyn Flea. This extremely popular market runs every Saturday from 10 am to 5 pm and boasts over 100 food vendors, serving a variety of eats such as chocolate-dipped frozen bananas at Nana's, gourmet grilled cheese and shakes at the Milk Truck, and Vietnamese street food at Queen’s Dahn Tu. 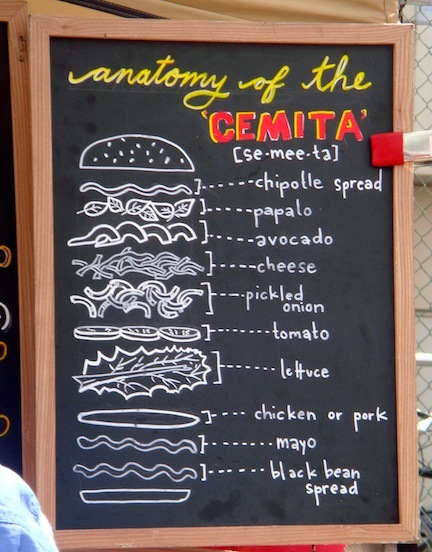 One tempting creation that I noticed right away in the crowd was the Mexican sandwich from Cemita’s. You definitely need a diagram to decipher all 10 layers of a Cemita, and thankfully they provide you with one! I ordered the pork cemita with the works. The servers toast the buns in front of you before piling on the goodies. All of the colorful layers and flavors blended well together in each bite. My favorite layers were the tangy and sweet pickled onions and the creamy avocado. I thought nothing at the market could top my very satisfying Cemita sandwich, but I was dead wrong. I can safely say the berry doughnut from Dough bakery was the BEST doughnut that I’ve had in my entire life. It was a pillow of happiness covered in a sweet berry glaze. Wow! Although the crazy days of summer are almost over, Smorgasburg is slated to stick around at in its outdoor location through November, so go check it out and let me know what your favorites are! The Hungry Bee is on vacation this week! Stayed tuned for more posts from Smorgasburg, Chinatown, ice cream making at Brooklyn Kitchen and more! 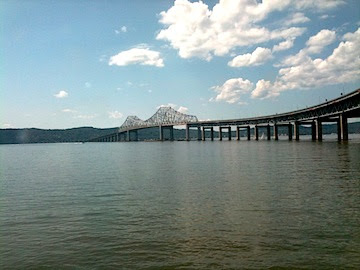 For a quick and easy weekend or day trip out of the city, take Metro North from Grand Central up to Tarrytown, New York. 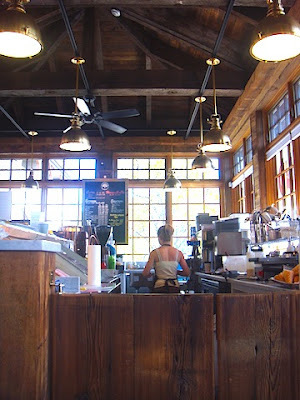 This quaint Westchester County village is located right on the Hudson River, which creates a relaxing atmosphere for maritime gazing, cultural tourism, and culinary fun. Within walking distance from the train station you can grab some oysters and beer on the patio of the Striped Bass restaurant, head to Main Street for some gallery shopping and more dining (many galleries are closed on Sunday however so check before you go), watch a show at the Tarrytown Music Hall, or enjoy some fantastic ice cream at the Lighthouse Ice Cream Kompany (also know as LICKs). LICKs makes their ice cream from only the freshest local ingredients, and it definitely shows. I sampled the hazelnut, vanilla, peanut butter, and chocolate. 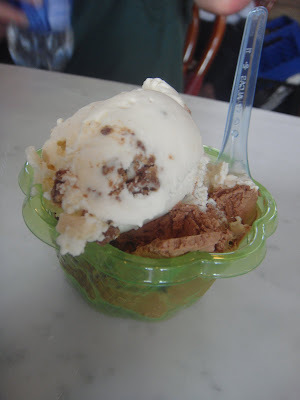 All of them had subtle, yet delicious flavor and were super creamy, yet light, making this one of the best ice cream experiences that I've had in a long time, and possibly ever (hazelnut was my favorite)! If one ice cream stop isn't enough, there is also the whimsical Main Street Sweets located just up the block to satisfy your cravings. 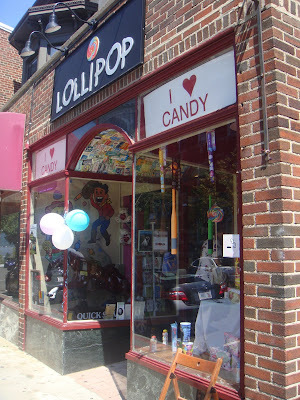 My sugary trip also included another exciting stop at Lollipop the Candy Shop. Besides having a large and impressive selection of lollipops, this shop is full of blasts from the pasts and childhood memories, including Pez dispensers, novelty candy, and gummy candy galore. The fun doesn’t end there in the Tarrytown area, because there are also many sights to see outside of the historic downtown, including the famous Lyndhurst estate, and nearby in the legendary Sleepy Hollow. 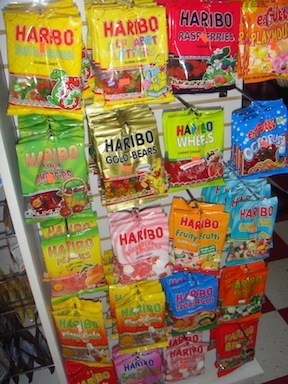 Next time you're in Tarrytown let me know what sweets you try!